Here’s the thing about shopping in Marrakech: It can be a dreamy, out-of-body experience that’ll leave you with an overweight suitcase and a longing to return—but the sheer volume of options can seem wildly overwhelming. If you know where to go, however, you’re golden. The city is something of a fashion fantasyland: silk caftans are draped in storefronts; heaping piles of silk slippers fill warehouse-size markets; artisans crouch outside of their shops with hammers, transforming tarnished silver into statement necklaces. And while tourists typically flock to the city’s bustling souks for these items, there’s a shopping scene that exists just beyond it—down tiny alleys and hidden streets—where you’ll score even better pieces with none of the chaos. Here’s where to go. Belgian designer and creative director Valérie Barkowski spent decades as the visionary behind a slew of international brands before opening Dar Kawa, a traditional guesthouse (or “riad”) in Morocco. The design aesthetic of Dar Kawa is magnificent—think Restoration Hardware meets Marrakech—and Barkowski’s intimate showroom, located minutes from Dar Kawa, is no different. Call to make an appointment, then, save room in your luggage for sumptuous tasseled bath towels and a hand-embroidered duvet cover. The concept shop—one of Marrakech’s best—feels like a Moroccan version of Colette in Paris. You name it, 33 Rue has it: modish silicone place mats, Warhol-esque Pop Art, dainty midi rings, wooden furniture, vibrant scarves, and more. The selection primarily consists of goods made by local artists and up-and-coming designers, and somehow, despite the abundance of items spanning two floors, the shop is immaculate. 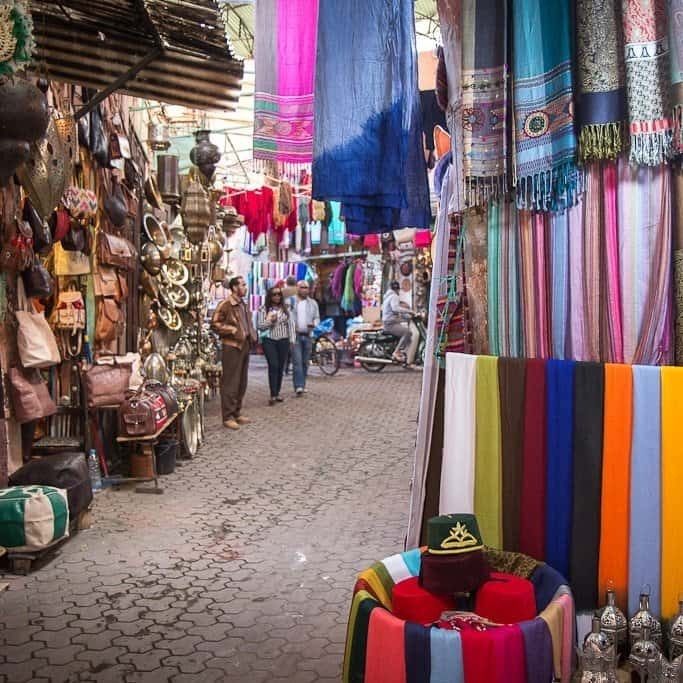 It’s a stark contrast to the famed souk, which proves challenging for indecisive shoppers. The expertly edited mecca for resortwear, jewelry, and accessories is an ideal spot to scoop up a few “beginner” caftans, should you find yourself skittish about committing to an overly flamboyant print. Recent collections have drawn inspiration from bohemian-chic destinations like St.-Tropez, Tangier, Goa, and Ibiza, but everything is designed and manufactured entirely in Morocco. If there were such a thing as loafer nirvana, Atika would be it. The shoe store boasts shelves upon shelves of rich leather loafers in every hue imaginable—from cobalt blue to pink patent and everything in between. For the risk-averse, there are a plethora of sensible options too, like camel-color drivers with silver horse-bit hardware. Pro tip: Atika doesn’t have a website, but ask nicely and they’ll give you an email address to use for personal orders. Forget everything you’ve ever known about chintzy museum gift shops. The one inside Marrakech’s Majorelle garden—a 12-acre botanical paradise—is chock-full of amazing pieces, like chic accent pillows and hand-hammered silver jewelry. Of course, the tastefully curated selection isn’t all that surprising, given that the garden itself was purchased by the late Yves Saint Laurent in 1980. Located just beneath La Terrasse des Épices restaurant, designer Meriem Nour Rawlings’s boutique is the epitome of old-meets-new: She incorporates ancient Moroccan techniques into contemporary pieces, like silk beaded tunics, suede fringed messengers, and breezy jumpsuits. Inside El Fenn, a trendy hotel co-owned by Vanessa Branson (Richard’s sister), you’ll find a rather unusual shopping experience: The boutique is situated in the middle of a bar and restaurant, and nearly everything—including the wall decor—is for sale. Also on offer: an eclectic collection of home accessories, vintage dresses, linens, pottery, coffee table books, handwoven blankets, and more.